For Rome Ciampino airport parking, we offer a range of car parks that are in close proximity to Rome Ciampino airport and offer a shuttle bus service to the airport which is included in the price. At an additional cost, you may also wish take advantage of the Meet and Greet Service. This allows you to drive straight to the airport and hand over your vehicle to one of the drivers of the car park and pick it up from there on your return. The transfer options for Riome Ciampino airport parking are not limited to just this. In fact, one of the car park operators listed above also offers a transfer service from Fiumicino airport in the event that you arrive there but depart from Rome Ciampino airport or vice versa. Moreover, you can also book additional services such as car wash and refuelling when you book your Rome Ciampino airport parking space on our website. All the car parks are open 24 hours a day, 7 days a week so no matter what time your flight is, you can guarantee your secure and low cost parking space with ParkVia. Booking online is easy and you can also choose between undercover and open-air parking. If you need any help while making a booking, please visit our "How to book" page. 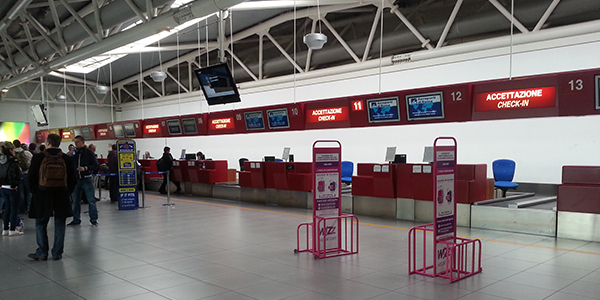 Until 1961, Ciampino Airport was Rome's main airport, with traffic summing up to 2 million passengers per year. The airport forms part of Rome's airport infrastructure together with Rome Fiumicino Airport. Ciampino airport is now one of the busiest and fastest growing airports in Italy due to low cost airlines operating from there. Rome Ciampino airport is located 12 km away from central Rome and is a joint civilian, commercial and military airport. It is served by the majority of low cost airlines (Ryanair, EasyJet, Wizz Air) which have flights to destinations such as Alghero, Bari, Brindisi, Cagliari, Bergamo-Orio, Trapani as well as major European cities such as London, Barcelona, Paris, Madrid, Frankfurt, Brussels, Berlin and Dublin.